I have two little tips for organization today – I am still in the throes of it, I’m afraid, but OMG I am loving both the process and the results! First, pens. I have a lot of pens. 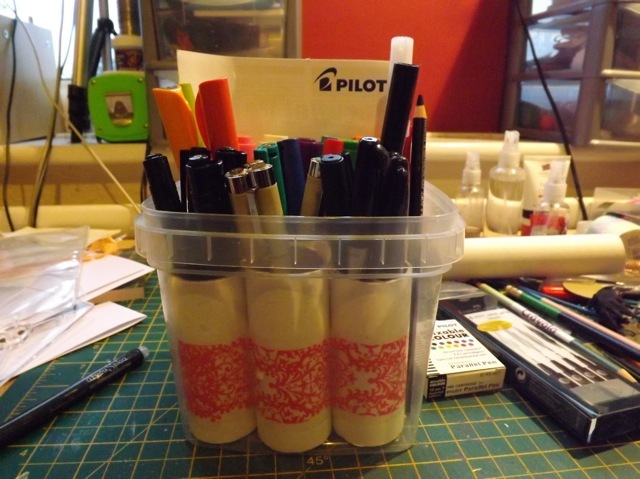 Some come with their own organization, like my Copic boxes, so they are done when they come. Other pens, especially specialist pens, come in their packaging, which may or may not work in whatever system you use. 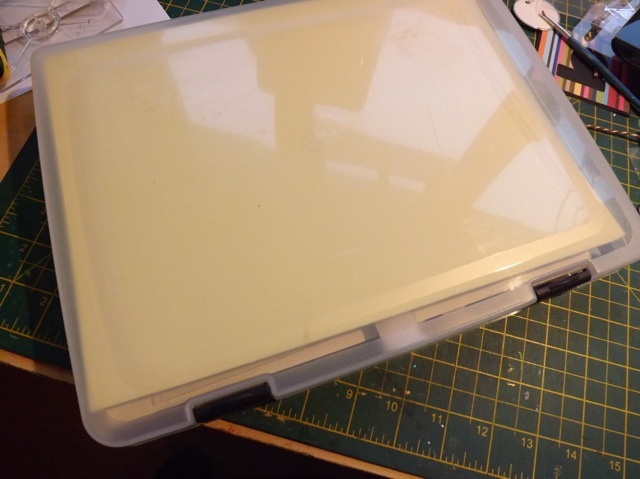 I do have an old pen tray from my mate Debbie’s shop (I think she just gave it to me as she had a retail rack and didn’t need it) but there are two problems with it. First, the holes are small so it really only fit the pens it was designed for – I found a LOT of my pens didn’t fit so its footprint was large but it was under-utilized – and second, because of that it became a catch-all for a bunch of random stuff. It was hard to actually find the pen I wanted in it. Now, for me, a BIG part of the organization is thinking about how you use things. 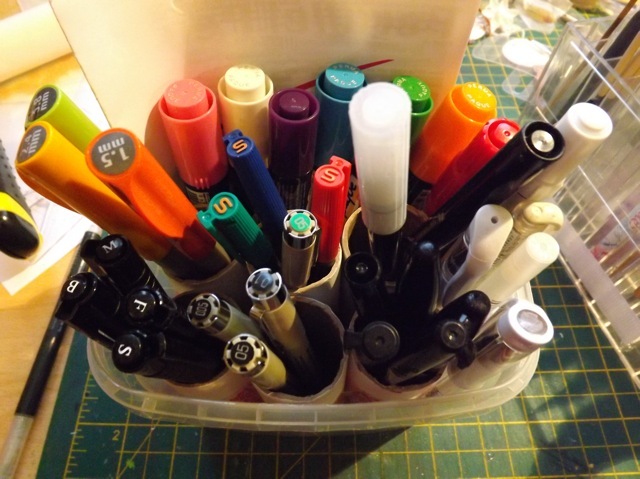 Rather than having my specialist pens scattered all over in various places where they fit, I wanted them all grouped together so that storage became my go-to place when I wanted a Pitt pen, or a white gel pen or a Parallel pen. I had seen someplace (probably Pinterest – isn’t that where all the good ideas are nowadays?) a desk organizer using toilet paper rolls but didn’t like the big size of the rolls and the fact it was loose, no bottom. I had a ton of laundry tab tubs, from reorganizing my ribbons into the back-of-the-door hangers, and that had become the temporary catch-all for my special pens as I was sorting. Hey presto! I got an old, quite thick and sturdy but not wide tube from Christmas wrapping paper (who doesn’t have a ton of them this time of year?) 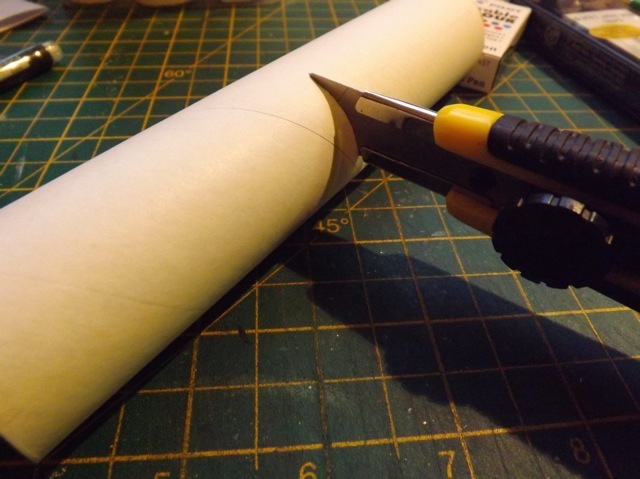 and cut it into smaller tubes. I arranged six of them in a 3×3 grid and taped them all together. The arrangement fit the tub I had. Then I just grouped the pens in the tubes, in the tub. There was enough room to fit my Permopaque markers at the back (they are quite thick) and all my white gel pens at the side. I also fit in the instruction manual for the parallel pens. Thinking about my process I know when I want a certain KIND of pen, these are the ones I want to browse. If a Sharpie doesn’t work, a Pitt pen might, or a Micron one. If black isn’t right, white might be. With them all in one place, all grouped, it makes selecting the right one a breeze! Not the most stunning piece, but am all about the Workflow, not the pretty. Next, back to stamps for a bit. 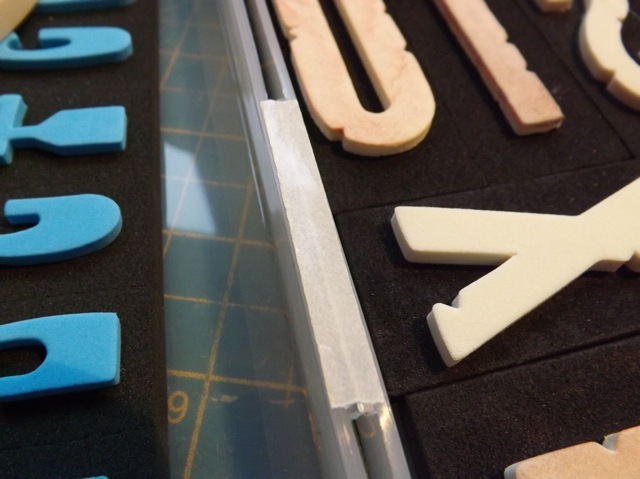 YEARS ago (OMG so many years ago) I had come up with a nifty storage solution for my foam stamps. I HATE having them all in a jumble, and having to hunt thru them all to find the letters I want. And they are so thick, they take up a lot of space. I got some paper keepers (from my local Staples) and had one set in each one. That was wasteful and again took up too much space. Plus, when you tipped the box, the letters all slid around a lot, or ended up in a jumble, as the box was thicker than the letter stamps. 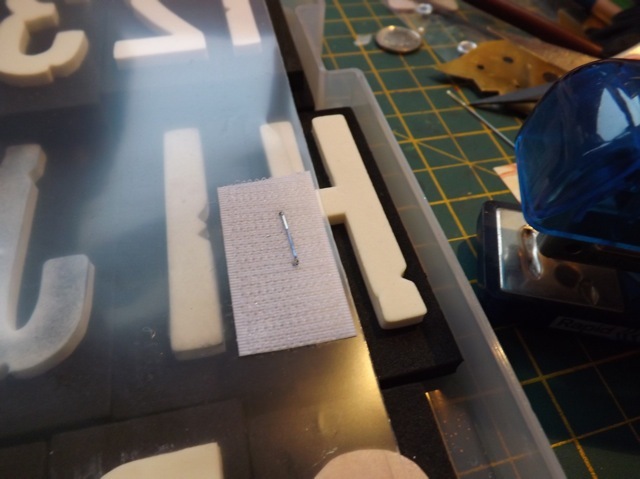 What I did was add a couple of sheets of acetate, fairly thick sheets, over each side of the box and stuck it over the hinge. I did this with plain tape, and it was starting to rip. 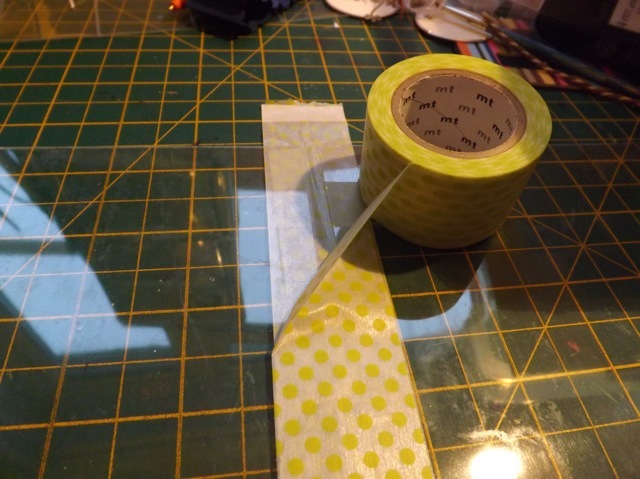 Today I took the two sheets out, and created a full length hinge with Washi tape, like so, leaving a little gap in the middle. I put this sheet back in place and the box was good to go once more. That yellow is actually a piece of craft foam. 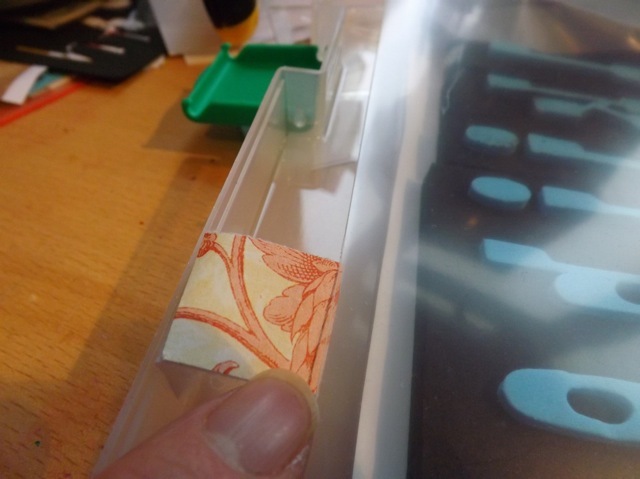 The slight extra thickness and the texture, keeps these thinner stamps from sliding around too much. There is a bit of velcro at the sides to keep the acetate in place. 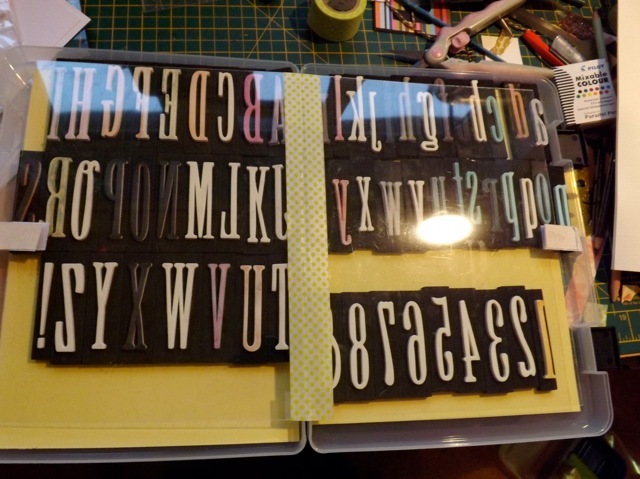 I had another two sets that could use arranging like this but I didn’t have any more thick acetate. I did have loads of those report covers from the stamp binder organization! So, I added tape to the existing hinges of the box, and stuck the fold of the report cover to that. Use strong tape so it holds. The report covers don’t allow the box to close as easily as the Washi hinge does, but it does close. I snipped top and bottom, down to the hinge, which helps a bit. Then I added the velcro to the sides. 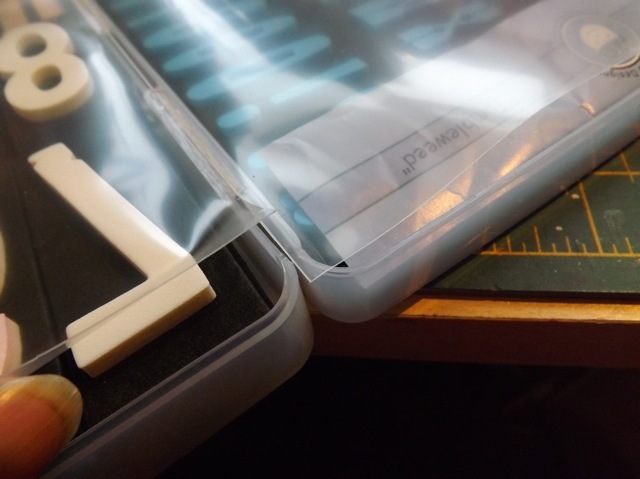 The sticky-backed velcro doesn’t stick as well to the slightly slick report covers, so I just added a staple. The final piece of velcro went on the inside of the box, so it folded over the piece on the report cover to secure it. 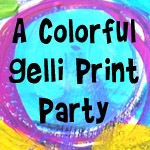 I added a bit of patterned paper over the sticky back that was stuck to nothing – recognize it from the card yesterday? LOL! The only thing left to do is to print a sample of the alpha from a shopping site image (so it can be smaller that the HUGE stamps) and put that on the side of the box so I can quickly see what is inside. 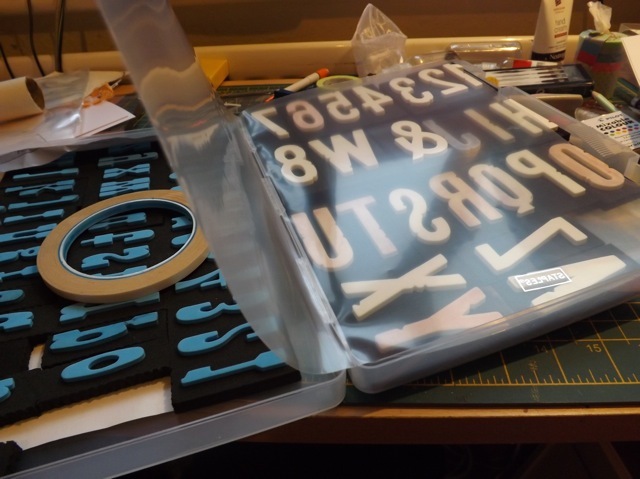 I still have a couple of sets of foam stamps in their original plastic boxes, but they are in a real state – they NEVER fit back in as well as they did, and I still have to paw thru them all to find what I want, so I need to unearth the other boxes like this I have and get them organized too. Categories: organization, stamping | Tags: stamp organization | Permalink. Blimey, for once we’re doing something similar.. I have my go to pens organised just so…although I have a basket separated into sections and that in itself holds basket ‘cups’ for my pens. A gift. One of the best I ever had! I am so glad you posted photos. I read your post as an E-mail first and was not clear about the folders. Wow, the visual really explains it all, so thank you for that. I keep my favorites in 3 favorite cups at the desk I am at most of the time. My favorite cup has a tiny Danish soldier on one side that Mother gave me years ago. The others are just Votive holders. For now I keep all my markers in a bath tray- in a drawer. I really like the way you decorated the wrapping paper rolls – great idea and thank you, and I cannot wait to follow your lead. We must be on the same wave length because I spent yesterday (which was an unbelievable cold, windy, rainy, snowy, ice pellets day) sorting all my pens and crayons. I have many Prismacolor crayons since both my kids got a pack a year and I just couldn’t part with them. They also had other brands of crayons that needed to be sharpened. I also am a collector of mugs, but I always said to myself they were too pretty to use. So I took four pretty mugs and used them as my pen crayon holders. The four I chose happened to be black with a design on the outside so you can’t see the inside if they get messed up. I also found a tray which the four cups can sit on and I can easily slide it in and out from under my little shelf I have sitting on my work table. Voila ! My pens also sit in various mugs and they are now being put to use! I’m only sorry I gave away my birthday mugs away ie mugs with your milestone age on it…You’re 30! You’re 40! You’re 50 maybe just as well! TFS have a great day!